We’ve had a pretty busy afternoon in our house! My children LOVE painting but they get bored easily of painting the same thing. To combat this, I always make sure I have 4 or 5 different activities to do in any one painting session. If not, 20 minutes of setting it all up is wasted when they’re bored 10 minutes later! Variety is the key to beating boredom! Today we had some fab Hobbycraft letters and shapes to paint (£1 each! Bargain!) Easter cards for the grandparents (one religious and one not), Bunny footprints for me to keep, cookie cutter printing and finally some templates of eggs for them to draw and paint on. Phew…. And all of this entertained them for a good hour! I don’t mind the mess and paint and glitter everywhere if they’ve actually sat and painted for a decent amount of time! It’s soul destroying when you set up a load of paint or crafts and they lose interest minutes later! Cookie cutter printing works so well on black paper! 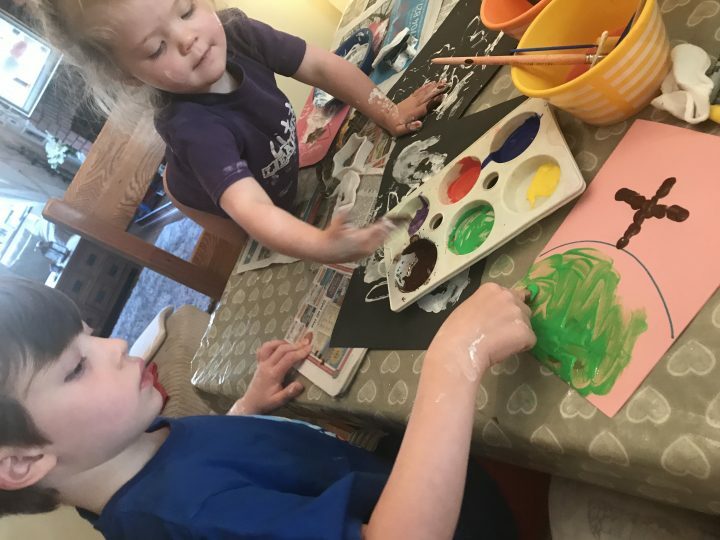 Whatever type of Easter, Spring break or half term you’re having, I’m sure there are some painting ideas here that could keep your little ones entertained and give you some lovely keepsakes too. Give them a good mix of child-led and adult-directed tasks in order to keep their attention. I do this mostly to avoid the inevitable arm painting/ fighting/ boredom that normally ensues when I just leave them to it. I gave them some free reign decorating their own eggs and printing with cookie cutters and then some templates and direction when it came to making the cards for the grandparents. Try this next time you do some painting and I guarantee it will keep their focus for a lot longer. Each activity probably lasted 5-10 minutes and then it was on to the next. At 2 and 5 that’s their attention span maximum for a craft activity. Carrot footprints – put orange paint on their foot and green on their toes. Print onto card and you have a carrot! 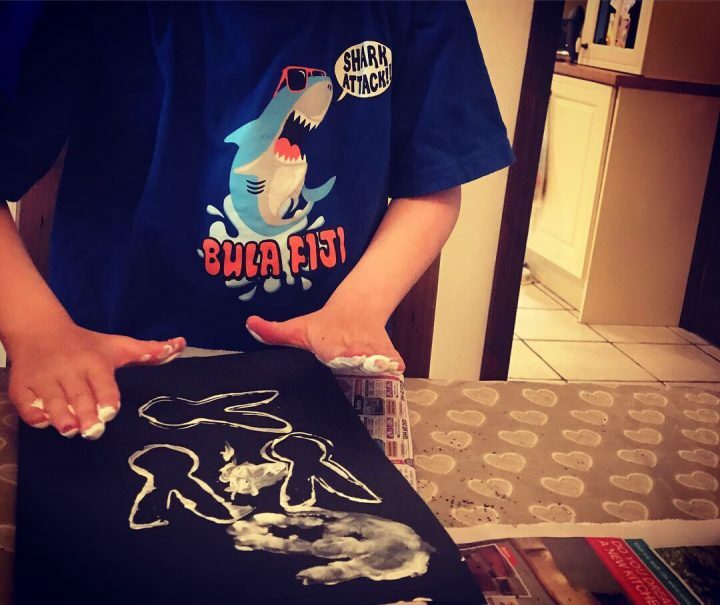 Bunny footprint – cover their foot in white paint and print on black paper. Stick a small piece of cotton wool on for a tail and paint on some ears! I cut around mine and stuck it on pink paper to make it stand out. Egg painting – draw an outline of an egg and let them finger paint inside it or use dabbers. Mine actually wanted to use my sharpies instead but finger print dots on the eggs looks lovely! 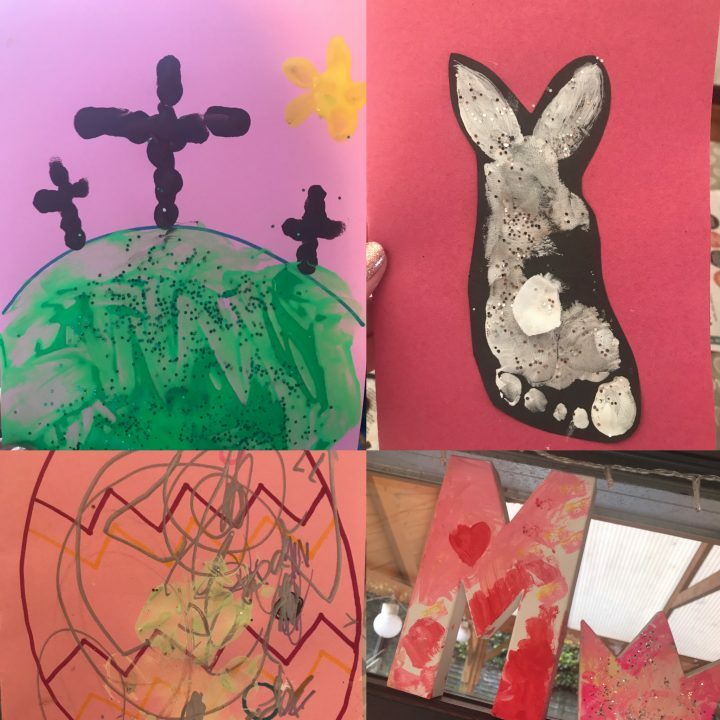 Finger print crosses – for a grandparent or relative who remembers the true meaning of Easter in the Christian calendar, a finger print cross on the hill looks very sweet and is thoughtful. I drew the hill and Noah used his finger to make the crosses and sunshine. I hope you find something useful here to try! 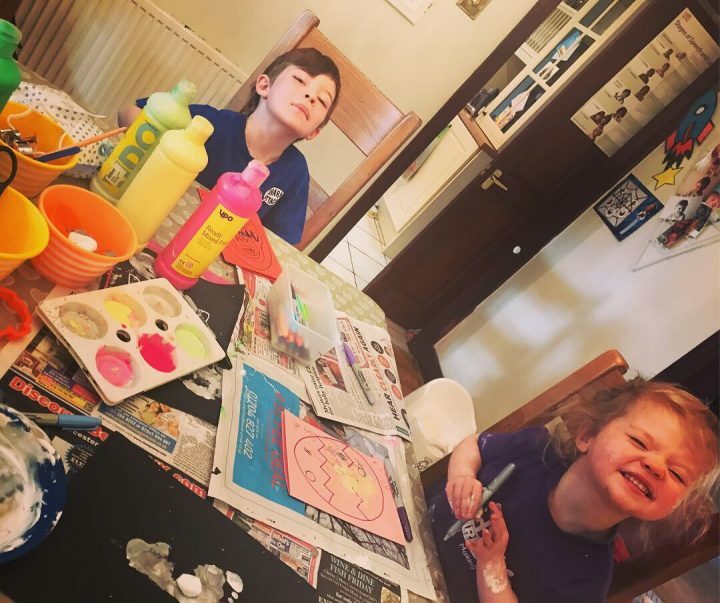 Dig those paints out to keep them entertained on a cold April day! 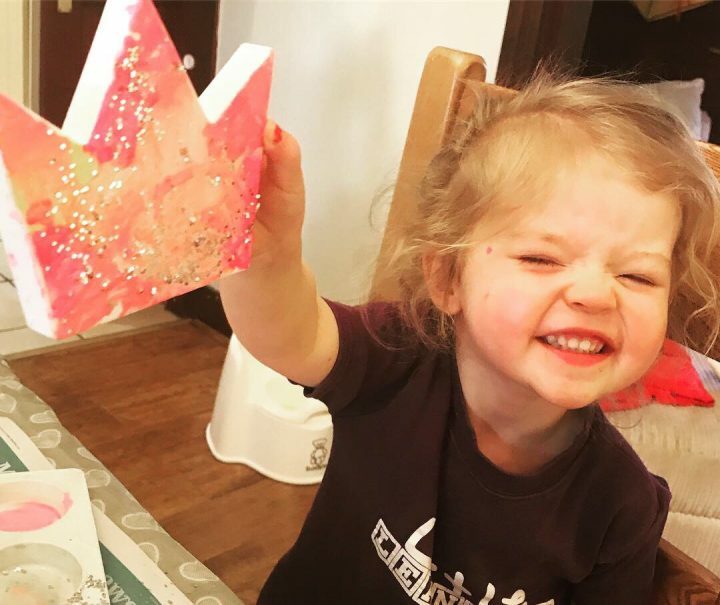 It doesn’t have to be anything fancy: A selection of colours, different sized paintbrushes or sponges, some cookie cutters, paper and card… even glitter if you’re brave/ slightly mad! 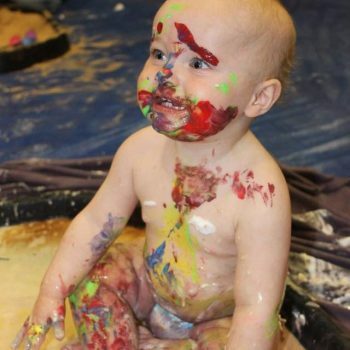 Have fun and embrace the mess! New products in the Little Learners shop! « Previous An easy but effective Easter card for toddlers!